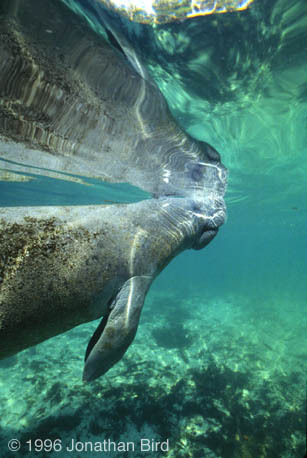 © 2002 Oceanic Research Group, Inc.
You may have heard about Chessie the famous "long distance manatee" in the news. 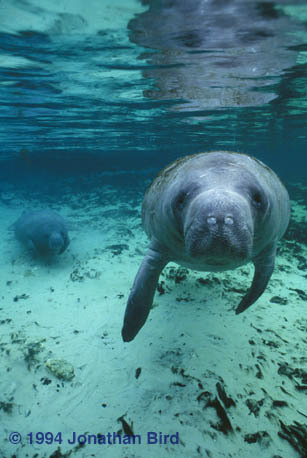 If you don't know what a manatee is, you can go to our manatee film script and read about them. Chessie is a male West Indian Manatee who, in summer 1994, earned his name by showing up in Chesapeake Bay, much further north than the species is known to travel. (Manatees normally live in Florida and the Caribbean). Fearing that he would die from the cold of oncoming fall and winter, biologists flew him back to Florida and let him go. Well, wouldn't you know it, that pesky manatee was back to his old tricks in 1995 when he took off and headed north again. This time, however, biologists at the National Biological Service's Sirenia Project office in Gainesville, Florida were ready. They had placed a satellite transmitter "tag" on Chessie so they could follow his movements and learn from his migration. Also, they could find and rescue him if he got into trouble. Below is a map of his locations and dates in 1995 (courtesy of the Sirenia Project). Nobody knows for sure why Chessie swims north. It might be that he has found something he likes to eat in the more northern waters. Perhaps he just likes to explore. But, as it turns out, Chessie knows what he's doing. In 1995 he swam all the way up to Point Judith, Rhode Island, setting a world's record for a West Indian Manatee! He has gone further north than any other West Indian Manatee in recorded history! But when the water started cooling off, he turned around and swam right back down the coast to Florida again. Unfortunately, his transmitter fell off in Connecticut, so his route back is somewhat obscure. (The transmitters have a special "weak link" designed to snap if the transmitter gets caught, to avoid harming the manatee). He was sighted along the way back to Florida by fishermen, boaters, and even a surfer. Biologists were amazed when he showed up in November in Florida, after swimming 3,000 miles round trip! Nobody can say for sure what Chessie is going to do this year, but this page will keep you posted. Thanks to the efforts of the Sirenia Project, there is a new satellite tag on Chessie, and we hope to follow his movements by updating this page periodically. Chessie approached and passed Morehead City, NC on July 9th. At that point, he was about ten days behind his schedule from last summer, but he was still heading north. He was spotted by several people in Morehead City, who were excited as the famous manatee swam through their local waters! Well, the bad news is that on July 17th, Chessie escaped from his satellite transmitter, so we don't know where he is. The good news is that the transmitter was recovered without an injured manatee attached, so we can assume that Chessie is okay. This is the third time Chessie has slipped free of transmitters (sneaky little guy, isn't he?). The transmitter was recovered near Beaufort, NC. Jim Reid, the Sirenia Project biologist in charge of the tracking project says: "We expect that Chessie is fine and continuing his travels north. He is probably continuing his 10-20 mile per day travel rate as he works his way toward the Chesapeake Bay." Whether he will make it all the way to Rhode Island again is anybody's guess, but we may never know just how far he gets, unless someone spots him. So now we can only hope that we get reliable reports from people who see the famous manatee in his travels. The winter of 1996/1997 was fairly mild, so the manatees did not aggregate as heavily as usual near the springs and rivers in Florida. Because of that, Chessie was not seen during the winter, and he could not be tagged. So now, as the summer of 1997 continues, we don't know where he is or how he is doing. Dr. Chip Deutsch of the Sirenia Project says: "We haven't seen him in a while, but there is no reason why he shouldn't be perfectly fine. He's probably up north right now." I'll keep you posted as I hear more! After being unseen for several years, Chessie was spotted in August of 2001 in Virginia. A manatee was seen in the waters of Virginia, and photographs of the scar patterns were compared to photos of Chessie from a few years ago. Scar patterns have confirmed that Chessie is alive and well and at this very moment, making his way south for the winter!! Here is a link to the Press Release. Chessie went off the radar for a few years then popped up again in the summer of 2011 in Maryland! He is still making his annual commute to his favorite foods up north! Cathy Beck of the Sirenia Project believes Chessie is fine even though they have not seen him for a few years. Chessie has a tendency to drop off the radar for a year or more at a time, but he seems very good at taking care of himself. 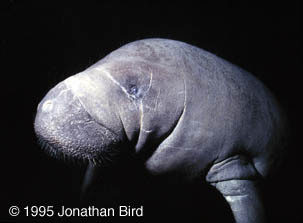 This is not Chessie, but a shot of a typical West Indian manatee in Florida. A manatee taking a breath at the surface. A manatee looking at the camera. Manatees are often quite curious. All images on these pages for non-profit educational use only.